We summarise evidence from the scientific literature about the effects of conservation interventions, such as methods of habitat or species management. Use the search box at the top of this page or browse the evidence using the icons above to search the database of over 5,000 papers that determine the effectiveness of conservation interventions. We also publish new evidence in our open access journal Conservation Evidence. Click here to view our 'how to' videos with top tips for using our website. A unique, free to publish open-access journal publishing research and case studies that measure the effects of conservation actions. What Works in Conservation assesses the research looking at whether interventions are beneficial or not. It is based on summarised evidence in synopses, on topics such as amphibians, bats, biodiversity in European farmland, and control of freshwater invasive species. More are available and in progress. 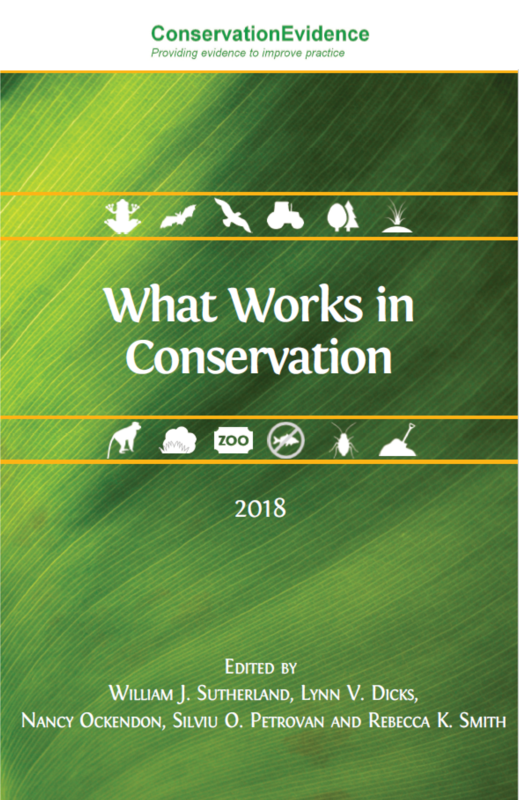 Download the PDF of What Works in Conservation 2018. A synopsis of evidence lists all the possible actions you could take to conserve a given species group or habitat, or to tackle a particular conservation issue. For each action, it brings together the available scientific evidence with summary statements that are quick and easy to read. It describes each piece of evidence with references, and links to more information on our website. Each synopsis is developed in partnership with an international advisory board of conservationists and researchers who specialise in that area. For a summary of the methods and evidence sources used for our synopses, please see the methods page.